Yesterday, we quite Grand Teton and headed north to Yellowstone. We visited the West Thumb arm of Yellowstone Lake. 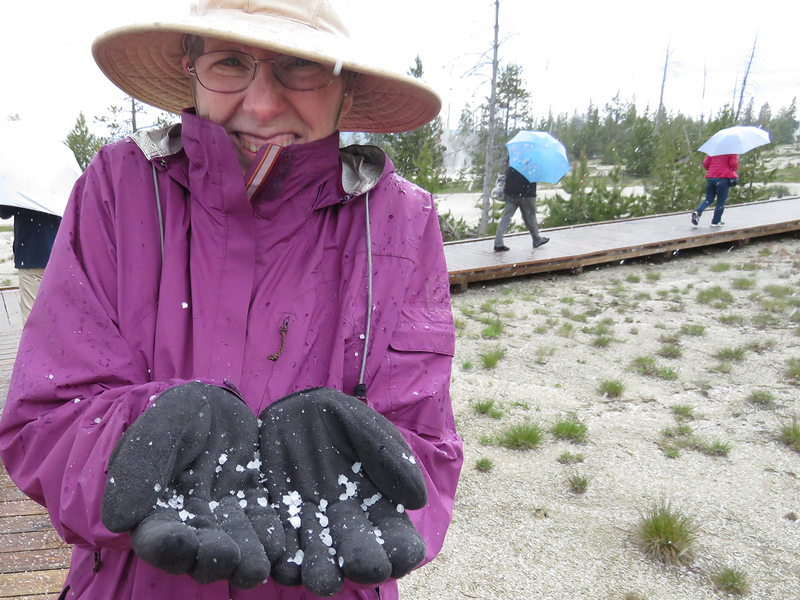 As pictured, while touring the geyser field, we were hailed upon. We beat feet back south to Teton. Dinner was at the Jackson Lodge, in the Mural Room. Our floor show was a wedding on the lawn below us. Our window seats gave us a ringside seat to their proceedings. Then it was back to our campsite for our last night in the tent. This morning, we drove across Wyoming, the long way, diagonally and ended up in Cheyenne.